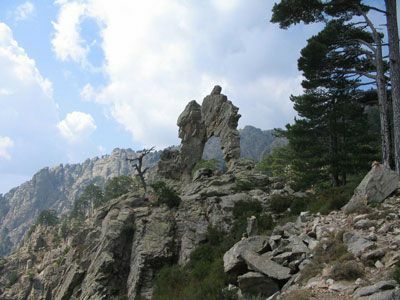 The Corsican pine is one of the giant trees of Europe. It can sometimes reach heights of up to 50 metres! The Corsican pine (Pinus nigra laricio), from the Pinaceae family, is also called Pinus corsicana. This conifer has a straight and slender trunk, and can reach very large diameters, up to 1.80 metres. As a young tree it has a conical shape, and develops a tabular shape as it ages. Its grey silver is formed of large irregular plates. Its ovoid cones are small, from 4 to 8 centimetres. Its fructification, every two to three years, is good. Its long needles, measuring from 12 to 15 centimetres, have an ash green colour and are supple, crimped and not sharp. Forest in Northern Corsica. © Jean-Baptiste Bellet licensed under the Creative Commons Attribution 2.0 Generic license. This species makes up large forests in Corsica, but has also been introduced into regions with siliceous soil, such as the Sologne region. The Corsican pine's characteristics make it the third species for reforestation in continental France, after the Douglas and maritime pine. It thrives in all types of climates. It can grow in a wide variety of soils, except in calcareous soil or soil that is too wet. A heliophile, it grows quickly in full sunlight. The wood of the Corsican pine is hard, heavy and very durable, and is thus used in cabinet making and in construction. Its buds are used to as a remedy for rheumatism and lung diseases.